Location: Vézins-de-Lévézou, in the Aveyron departement of France (Midi-Pyrenees Region). 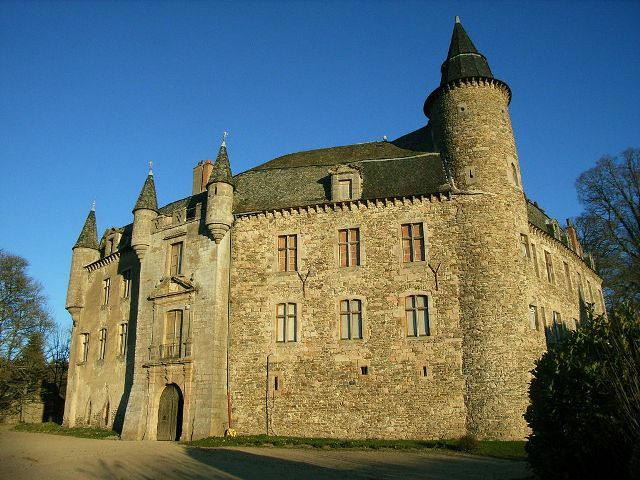 Notes: Château de Vezins is a castle located in the municipality of Vézins-de-Lévézou, in the French department of Aveyron. This is the Lévezou Vézins family that still owns today. The building is registered as historical monuments in 1990. He has two architectural interest: its defensive form horseshoe (unique in the department of Aveyron) and three identifiable styles (XII century seventeenth century and nineteenth century) that today have a fine example of architectural evolution, Vézian Vezins fortress (1120) to the current monument. Built in a valley, it still dominates the village built in an arc around the ancient walls of fortifications at the foot of the terraces of the castle. Burned accidentally in 1642, it was rebuilt at the same time on its original bases with Florentine architectural competition working for the Duke of Arpajon in Sévérac (see details door renaissance) Originally (tenth century, see previous), the castle (probably a simple tower with wooden fence) was perhaps built on a motte still visible behind the crenelated wall that closes the court, and that was drilled in the middle to the inlet passage (north entrance, courtyard side).